Then, four years ago, a dedicated and determined volunteer named Oles Kromplias was in the thick of events. It was his unit that liberated Mariupol. Kromplias recorded all the events on a unique film camera and wrote artistic reports... for the glamorous men’s magazine Esquire, which then appeared in Ukrainian as well. A successful marketing communications specialist, he became an activist of the Euromaidan who participated in all significant events and photographed everything. His pictures were included in the symbolic collection called The 50 Best Photos of the Revolution of Dignity. Then Kromplias tried to help defend Ukrainian Crimea, and he went to the peninsula at the very beginning of Russian occupation with several activists and journalists. They were captured, and Kromplias and his friends were tortured and mistreated for a few days. Ukraine was able to get their group released then. Upon his return, the former marketer and protester volunteered for the front. It was the latter half of June 2014. In Mariupol, Ukrainian flags were already flying, and our boys were getting ready to go further... Kromplias recorded moments from the lives of his brothers-in-arms. Here they are shown cooking a lunch, there they are sunbathing, while another photo shows them anxiously standing watch... The pictures show soldiers of the Azov Regiment, the Sea of Azov, the sun, and the expectation that the war would end in a few days, and all the boys would return to their peaceful occupations. The atmosphere of the summer of 2014 seems to have been conveyed best precisely in Kromplias’s works. He has managed to capture the mood of fighters who are preparing for something unknown, perhaps difficult and terrible, but that which will last for a very short time and surely end with our victory. Kromplias’s photos show combat episodes as well – separatists taken prisoner, a killed Ukrainian soldier’s body being carried on a stretcher covered with a Ukrainian flag... But it is not June and Mariupol, but rather the beginning of August and the early stage of the Battle for Ilovaisk. But four years is a long time. When visiting Kromplias’s photo exhibition “Front Line,” held within the framework of the “War Is Nearby” project in June 2018, all these images are perceived quite differently than in the fall of 2014, when the author first printed them out on returning to Kyiv after suffering a concussion. Today, the war has become part of our lives. And, although the project is called “War Is Nearby,” we feel that the war is already within ourselves. Still, there are probably other people for whom the reality in which Russian aggression is being unleashed on Ukraine has been too heavy to recognize. It is for them, in fact, that the project “War Is Nearby” has been launched. 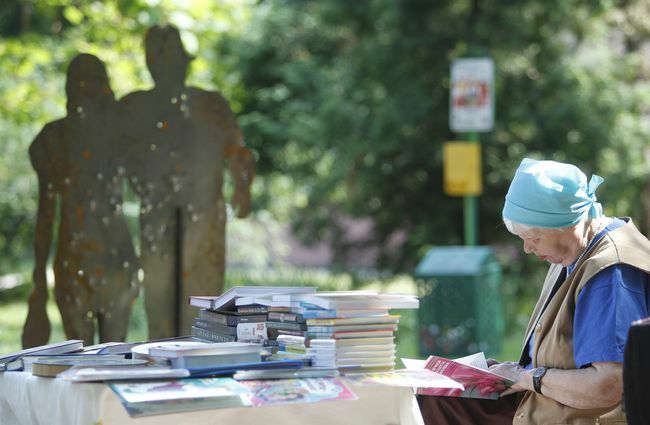 The photo exhibition “Front Line” and installations on the streets of Kyiv are elements of it. Kromplias considers the “War Is Nearby” project to be part of an information warfare campaign. This is the case, but no less important is another aspect – not only an outwardly directed anti-aggressor message, but also a call directed inside us, which should awaken a “sense of war” within us. But if you, having looked at this part of the project, will then visit the photo exhibition, which is displayed at the Transformer Center in Velyka Zhytomyrska Street in downtown Kyiv, you will be surprised, for you will not be scared there. It only diplomatically reminds the visitor that the front is close, much closer than it seems to you. Kromplias’s pictures show the war’s light version, a war that is not shocking. It seems almost like peaceful life. The only difference is that there, at the front, people die more frequently, but they always die as heroes. The exhibition can safely be visited by people who are very far from the front reality. They will be able to read interesting stories under each photo, view beautiful, high-quality pictures, and go away, for example, to the nearest popular and fashionable bar.